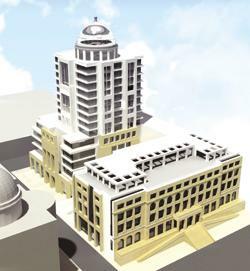 A computer-generated image of the planned five-star hotel in Benghazi. International Hotel Investments plc has signed a joint venture agreement with the Libyan Foreign Investment Company for the development of a 360 bedroom, five-star hotel in central Benghazi, Libya's second largest city. The signing followed a site inspection by Libyan Prime Minister El-Baghdadi Ali El-Mahmoudi during which IHI's development plans were outlined in some detail, the company said. The agreement paves the way for the preparation of construction, expected to start this year. The hotel's operation will be entrusted to IHI's subsidiary company, CHI Limited. The hotel will stand on a 7,000 square metre footprint on the waterfront in Benghazi. Part of the present site housed the former, historic Al Jazira Hotel. The hotel's 360 rooms will include a number of executive bedrooms, suites and a presidential suite. The hotel will offer extensive conference facilities, restaurants, business centre, a spa and underground parking for almost 100 cars. The development will also include a number of serviced commercial offices and retail outlets that will help to transform the area into a hub of activity, IHI said. The Libyan Foreign Investment Company is a major investment arm of the Libyan government with extensive experience in hotel investments in the Middle East, Europe and other parts of the world. IHI, a subsidiary of the Corinthia Group, is an investor, developer and operator of upscale hotels in Europe, Middle East and Africa. It owns landmark properties in St Petersburg, Tripoli, Budapest, Prague, Lisbon and Malta.